Explore Colour Trends 2018, a hand-selected colour palette curated by Benjamin Moore’s Colour and Design Team. Benjamin Moore's Colour Trends 2018 features a palette consisting of 23 warm, energetic hues. Each year Benjamin Moore director of strategic design Ellen O’Neill and her team travel the globe to absorb ideas and imagery from design fairs, art exhibitions, and cultural happenings. 2016's COTY was the warm but crisp Simply White while last year's COTY was the elusive amethyst Shadow. Distilling their observations from recent travels, the Colour and Design team have announced a new COTY, selected from 3,500 hues. A vibrant red, Caliente is the 2018 Colour of the Year. Caliente joins a Colour Trends palette of 22 other hues ranging pale pink to oxblood, partnered with agreeable neutrals (steely grays; a cool jade). 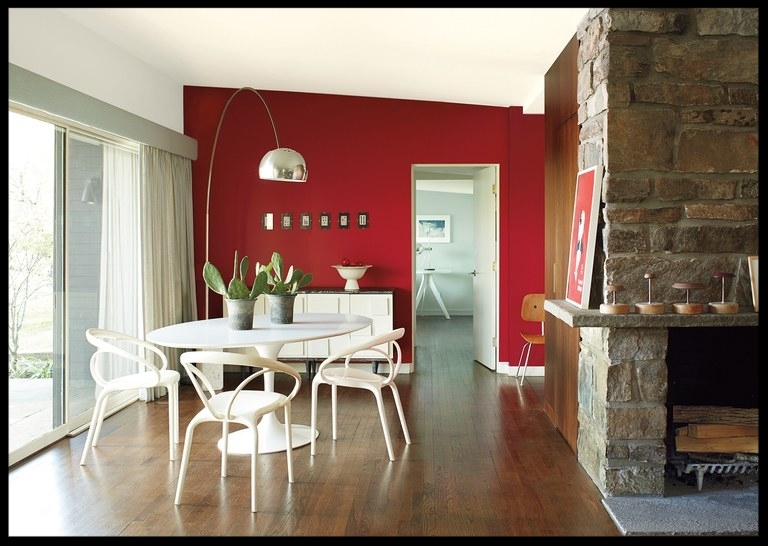 Caliente emerged as a front runner for Colour of the Year when Benjamin Moore's team noted that reds appeared on every runway in the new year; red glowed within Stockholm's Royal College of Music concert hall; red flowed across the curves of Eero Saarinen's elliptical newly restored TWA lounge; red showed up everywhere as a significant force. Interviewed by John Bessler for Architectural Digest (posted October 10, 2017), director of strategic design Ellen O’Neill relates parts of her own journey toward selecting Caliente as Colour of the Year 2018. I’ve just been stashing more evidence ever since—the red robes in The Handmaid's Tale, at the Emmy’s they all came out dancing in red, the Comme des Garcons show at the Met. Have you seen the "Items" show yet at MoMA? I was going crazy. There were so many red items—a hoodie, a sweatshirt, a leisure suit, this Issey Miyake garment made with a single red thread through a knitting machine. A red puffer coat from Moncler, the red bandana. Throughout the show, red was really acting as the signal, the stop sign. It's saying, Look at me." Visit us at Upper Village Paint & Wallpaper to experience Benjamin Moore’s vivid Colour Trends 2018. Our knowledgeable and friendly staff will be pleased to take you on a colour tour. The richness and nuance demonstrated through the Colour of the Year and Colour Trends 2018 palette can only be achieved with Benjamin Moore products. 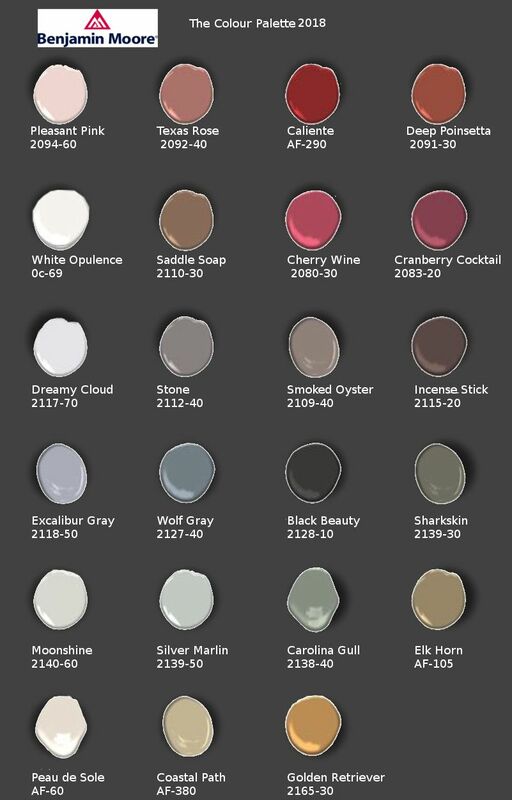 Offering residential and commercial paints for any project, the Benjamin Moore portfolio includes Aura®, Aura® Bath & Spa, Regal® Select, Natura®, ben®, Advance®, Arborcoat®, Scuff-X® and Aura® Grand Entrance®. All 3,500 Benjamin Moore colours are available in pint samples at local retailers along with Colour Trends 2018 curated palette cards. Benjamin Moore products are exclusively found at the more than 5,000 Benjamin Moore independently owned paint and decorating retailers across the U.S. and Canada.